This most popular cleansing oil in Korean cleansers, has a consistency of a sherbet that melts to your skin when applied. It is a convenient and a non messy choice of removing moisturizers, foundations, sunscreens, makeup (waterproofs!) and stubborn debris without drying skin after use. Can be carried around when travelling which includes a small spatula to scoop out contents. Packed with great ingredients like Papaya extract that exfoliates, evens skin tone and brightens your skin. Acerola Extract that contains high percentage of Vitamin C which locks in moisture in skin, repairs skin damage and also brightens up your complexion. Raspberry extract that soothes and relaxes irritated skin. 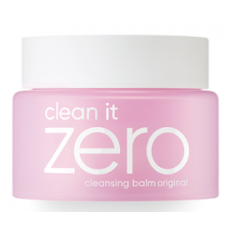 the Banila Co Clean it Zero is sold every 4.8 seconds in Korea and many parts of the World! What's New? Some ingredients were replaced like Mineral oil into natural Ester Oil, Butylated Hydroxytoluene is scratched from the ingredient list while Vitamin E Acetate is added, making this balm cleanser suitable for all skin types. And Butyl Parahydroxybenzoate is repalced with Phenoxyethanol, an ingredient found in grea extract. The texture is also improved which made it more smoother and softer and the melting point is increased to prevent melting on higher temperature. This product collected hundred of Reviews and acquired a consumer satisfaction rate of 4.6 star rating. To read reviews and comments of customers who bought this product in other stores, please read here. Scoop a pea size amount with the spatula and spread to dry skin. Masage cream over face, sprinkle warm water until it gets milky and melts away makeup and dirt. Rinse off with lukewarm water and dry. Follow it up with your favorite Korean Water-Based Cleanser.You can find all the Water-Based Cleanser here.